I need your full and undivided attention for this. Don’t you dare try multitasking while you read this post; this is THE post. Ready? I love rice. 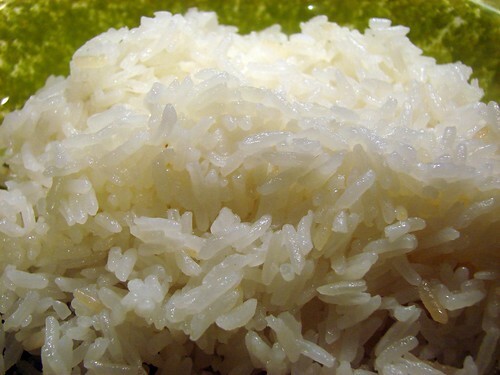 I’m Panamanian, we serve rice about twice a day and at least 5 days a week in my country. It’s the law, it’s our religion. Well, not really, but it would be if I was into politics or religion. Here in Houston, when you walk into the Price household, we have Rice Laws and Regulations. Those who do not abide by these, pay a mighty price. Lindsay, my awesome hubby, has learned to abide by, appreciate AND understand these regulations, not to mention the sanctity of rice. I’m not talking about ho-hum instant-not-rice-rice or the sacrilege of parboiled-not-rice-rice. I’m talking about honest to goodness, no frills, basic, beautiful LONG GRAIN WHITE RICE rice. Amen. These days I’ve become all culty about The Holy Grain. Following the little, barely known (to me) sects of Basmati, Arborio, and… JASMINE RICE. Oh.my.GAWD. How did I not know about Jasmine rice? It is the only type of rice I buy for my basic rice needs. It’s like magic to me. It’s better than oxygen! I love everything about it. The scent. The texture. The taste. Sigh. 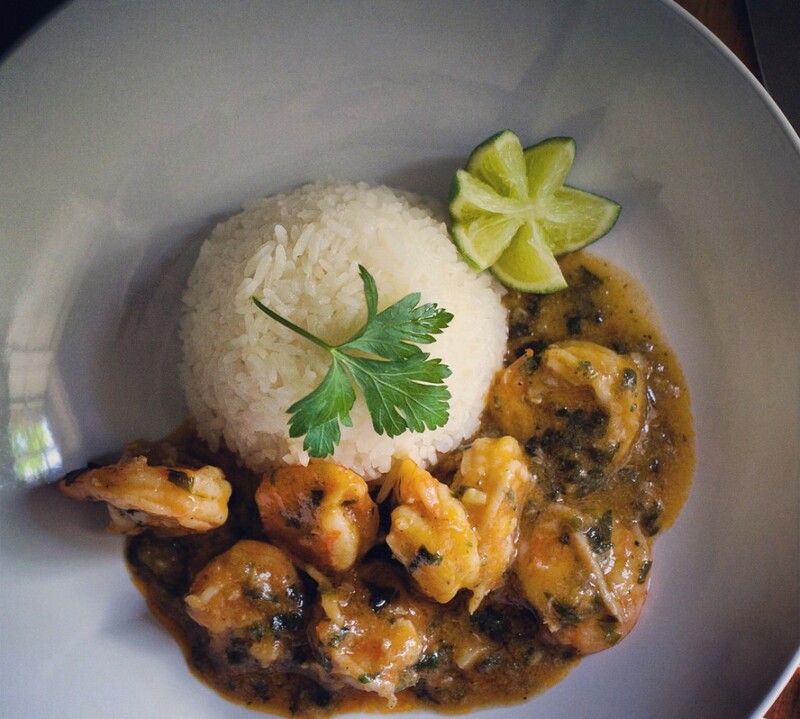 Here’s how I make perfect Jasmine Rice Panamanian Style. It just rocks. 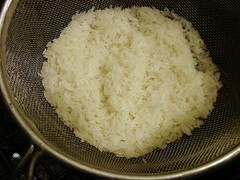 Perfect Rice Law #1: A quick rinse is all that’s needed, but do not begin rinsing before you start heating up the pot. Once you’ve rinsed, you don’t want the grains sitting around too long. If you do, you’ll end up with a goopy mess with hard grains in it. Put saucepan on stove over high heat, add oil. Rinse rice–easiest way is to put it in a colander and run it over cool, tap water. Let it drain; you may need to give it a quick shake to get the excess water out. By now, your oil should be nice and hot, so throw in the rinsed rice. Stir it around every couple of minutes; there will be enough oil to coat all the grains. *Note: When you put the oil in, it may seem like you’ve added too much oil. You haven’t! With this method you’re frying the rice before cooking it, if you don’t have enough oil the grains will scorch. Trust me on this one, try before changing. Once the grains begin turning white, about 5 minutes into it, you’re ready to add the water and salt. PRL #3: Make sure you’re using just cool water, stir in the salt and test it to suit your taste. FYI, the rice will absorb the salt, don’t worry if at this point it tastes just slightly salty, the grains will absorb the water and salt and it will dry to perfectly seasoned rice. It will come to a boil pretty quickly, and the liquid will begin to evaporate. PRL #4: Never stir your rice once the liquid begins to boil. At this time put a tight-fitting lid over it before it is completely dry. You should still see some bubbling at this point. Then lower the temperature to medium low. Now leave it alone. PRL #5: Don’t mess with the rice. Don’t look at it. Don’t touch it. Don’t wiggle the lid. Just let it be happy and warm for about 20-30 minutes. This part is crucial. You’ll notice that most recipes suggest a 2-1 water-rice ratio. I use a lot less liquid because the steam generated in the pot at this point will.take.care.of.every.grain. Trust me. I’ve made rice this way for about 20 years now. 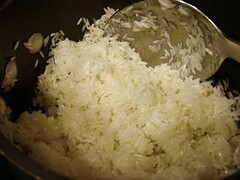 PRL #6: The sticky rice at the bottom of the pot is a diamond in the raw. 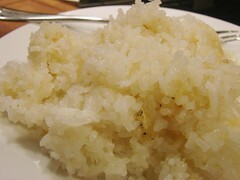 Because of the oil and te time spent steaming, some of the rice at the bottom cozy up to each other and become crusty. It’s hard to describe, but this part of the pot is so special it has its own name. Panamanians refer to it as concolon, Puertoricans call it pegao. I’ll look into other countries to give you more references to it. OK, that’s it. The Rice Nazi is done.